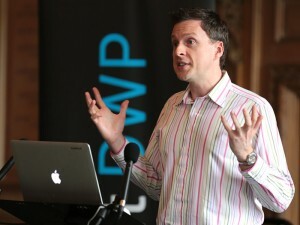 Today I presented our 2020 vision at the last of the Spring 2015 Sprint DWP events in Leeds Civic Hall. In the presentation I covered the "perfect storm" of pressures and opportunities for the department, and the need for a joined-up and evolving Business Design for the future, if we are to make the most of the opportunity. I explained the idea of High-Touch and Low-Touch services, to deliver the policy intent in a modern and efficient way. I finished by explaining the design process and the critical enablers in the business design, and the way we are bringing these into reality. My requests for the attendees were that they should feel able to challenge work that doesn't join up, pass on this story, and recognise the vision is evolving. and give some highlights of what we’re doing now to make it into a reality. Our transformation is now well underway and it’s gathering momentum. We are past the point of asking ourselves if this is something we should be doing, and starting to get into the nuts and bolts of what is it really going to look like and how DWP is going to get there. We are in a “perfect storm” of external pressures on the department, including citizens’ expectations of us and the financial pressure we’ll face during the next parliament. But we also have a huge opportunity through the change programmes that we are running, and our technology that needs rebuilding. If we are to get this right and make the most of this opportunity, we need to have a clear vision for where we’re trying to get to. And we will need the help of everyone at Sprint DWP to direct all of our change efforts towards making it a reality. For that to work, we need a joined-up Business Design to work towards, and it has to be both ambitious and achievable. Just after I joined DWP we held a Digital Transformation Group conference in Sheffield, back in April last year. In the panel session I got asked “what does a great year look like?” for our business transformation. That’s always a great question to ask (and we should keep asking one another). My answer was that it would be a great year if we could get to agreeing a much clearer view of what DWP would look like in the future, and start to align our change programmes so that they know which pieces of that vision they are building. So the good news is that we do have a much clearer view of our future, and we’ve produced a first version of a joined-up roadmap across the department that starts to show how the moving parts fit together. As you’d expect with a challenge of this scale, it hasn’t all been plain sailing! If everyone loves your idea, then you should worry it’s not forward-thinking enough. Last summer we created a picture and a video to explain our transformation journey. The photo shows us having a conversation about it in the business transformation slot at the Digital Academy. We ended up showing it to about 1,000 people, and got lots of feedback that it was really helpful, and also lots of great suggestions for how to improve it. We have come a long way since then, and we have worked out so much more detail. So we wanted to create a new version that we could share even more widely around DWP to help bring our transformation story to life. And I’m delighted that we’ve unveiled the new version of the video today. It was still “cheap & cheerful”, but I am really proud of where we have got to - the team have done a great job of bringing people together from all over DWP to create a positive and exciting vision of the future. We’re also really excited that the video has a ‘superstar’ voiceover for the first time - featuring members of our Executive Team. A key message in the 2020 vision is that there are some things we do at the moment to deliver our services, which we don’t have to do that way in the future. We have the opportunity to deliver a better service for our customers, and do it in a more modern and efficient way for our taxpayers. The customer experience layer describes DWP’s customer proposition in the future, such as “Better use of existing data”, “More automation where it’s safe”. Those are the words which have been introduced across DWP in the last two rounds of our internal DWP Story events, so they should be increasingly familiar to our people. One of the aims of the picture is to explain how we organise ourselves in future to deliver that customer experience, across our people, technology and ways of working. We want to be clear that it’s not just about building websites, but about our ambition for the way the whole of the business operates. A key part of the underlying thinking is about us making explicit choices between using “High-Touch” and “Low-Touch” ways of delivering our services. We’re saying “High-Touch” to refer to the parts of our services where we need to use manual interventions to operate the business. That could be face-to-face, on the phone, or carrying out a back-office process. When we do things in a High-Touch way, we are investing the efforts of our people, and that comes at a cost, especially when we factor in overheads like the buildings those people are in. We might choose to use High-Touch because of a person’s health condition, or we might do it because our data shows it will reduce the potential for fraud. Either way, complicated cases become easier if our front-line people are presented with the right information, to help them give the best advice. The opposite of that is “Low-Touch”, which refers to the parts of our services we deliver without human intervention. Low-Touch means a simplified, automated way to achieve the same outcome, which is quicker or cheaper, maybe both. DWP already has many Low-Touch activities today, like automated processing of payments. But at the moment we sometimes have to ask customers for information which they have already provided to us. Why would we do that if we were able to make smart use of information we already have, so that we can carry out the process automatically? That’s better for our customers, and it’s better for DWP. We need to recognise the differences between High-Touch and Low-Touch, and we need to knowingly choose which is right at any stage to deliver services to customers. In our vision we want to systematically use Low-Touch whenever we can. One of the ways that we’re taking this to action now is that we’re looking at areas where we can build a proof-of-concept for High-Touch Low-Touch so that we can demonstrate it working for us. Is this realistic? Technologies and ways of working that are now commonly used in all sorts of organisations give us the opportunity to continuously build up data and use it throughout a customer’s journey with us, in a way which hadn’t been envisaged back when most of DWP’s current IT was created. So the focus is on making safe decisions in individual customer experiences, and also building up a big picture from the data, to make sure we’re making the right decisions in general, and to help us continuously improve. That’s why we’ve put our intelligent use of data story right through the middle of the 2020 picture, because it's now becoming central to the way we deliver our services. And having the right technology and data science skills will be crucial. Another important feature of this vision is that it’s a user-centric organisation that is constantly exploring and searching for what works, and making those ideas part of the way we operate the service for everyone. In that sense I describe the Business Design as an “Evolving” Operating Model, rather than a static Target Operating Model. So this is not a set-in-concrete, linear description of exactly how the organisation will work in 2020. We’re laying out the key moving parts of DWP in the future, and for some of these we’ll only build up the detail through many years of adapting and improving, working closely with our change programmes which inform, and are informed by, the overall design. This is why it’s critical that we have our User Researchers understanding what our customers need from us. We’ll know more about our users than we’ve ever known before, and this can help us make life easier for them, and for ourselves. 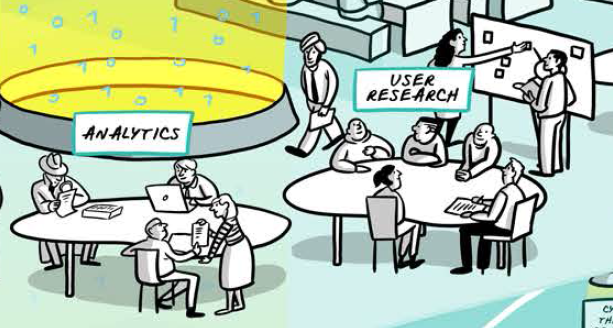 So User Research will remain a central feature of DWP in 2020, and already today we have BTG’s User Researchers working as part of the programmes. Thinking about the future costs to operate the business, how do we know that this is a credible story that will make sense from a financial perspective? Our analysts have built confidence through their work, by looking at the opportunities to improve our current customer journeys with High-Touch Low-Touch thinking. And of course our Analytics team will also play an important role in DWP in 2020, which is why they’re also shown here. I’ve covered why we need a Business Design, and some of the important features of it, but I also wanted to say a few words about the design process we’ve been going through to get to this point. This is “The Squiggle of the Design Process” by a designer called Damien Newman, which he uses to explain how things are uncertain in the beginning of a design process but become increasingly clear. At the start there was lots of uncertainty and it was very difficult to make a plan for how we were going to get there. But we knew we needed to get to a reasonable idea of how the size and shape of the business will change over time. For example we know all this is going to need people with different skills and a different grade mix, working in different ways. To get this right we have to describe how our people, processes and technology all work together to deliver our services . The process of doing this is as much an art as it is a science, but we’re moving along the squiggle now, and we have made sense of the different moving parts. One of the things that’s become clear in our work is that at DWP we’ve used technology for years to support admin tasks, but we can now use it to deliver services in a radically different way. So it’s becoming clear that we are now at a turning point where technology and data become central to the way that DWP operates. We’re starting to see the detail of the business design becoming a lot more granular than the general Civil Service Capabilities Plan (in areas like Cyber Security). This work is helping us collaborate with HR colleagues to build out that plan to get the right skills in the right places in the organisation. Even just introducing a common vocabulary we can all share is a big help. We’re now starting to get to the clarity we need on this, and we are at the point where the concept is clear and the focus shifts to delivery. Our Enablers are the six critical areas where we’ve identified we need to drive a step change, to "do more". These aren’t the only things we need to do, but they’re the ones that we have to get right. And importantly the Enablers are Business Capabilities so we mean “the things DWP is able to do” - the combination of the technology, the people and the processes, to deliver the business outcomes. We’ve drawn these as being under construction in the picture to reflect that they’re building our future, and they’re already underway. For example, Universal Credit is already building important parts of our “Decision Making Based on Trust & Risk”. We’re working together to drive out the details of how this becomes the way we operate across DWP, for example in Pensions. And we’ve mobilised a piece of work that will bring together all of the different aspects of “Data”, which is central to the vision, so that we have a joined-up plan for what we need to create. It’s important that we all start to understand Government as a Platform. DWP will be part of Government as a Platform, where government will increasingly be delivering services by sharing capabilities across departments. We already have some shared capabilities, GOV.UK is a shared publishing platform, and Verify is a shared identity assurance platform. There’s also the Performance Platform, and the Digital Marketplace. The Government Digital Service are actively looking at what next, and their thoughts are around areas like payments, status tracking, and address details. How are we making this all real? 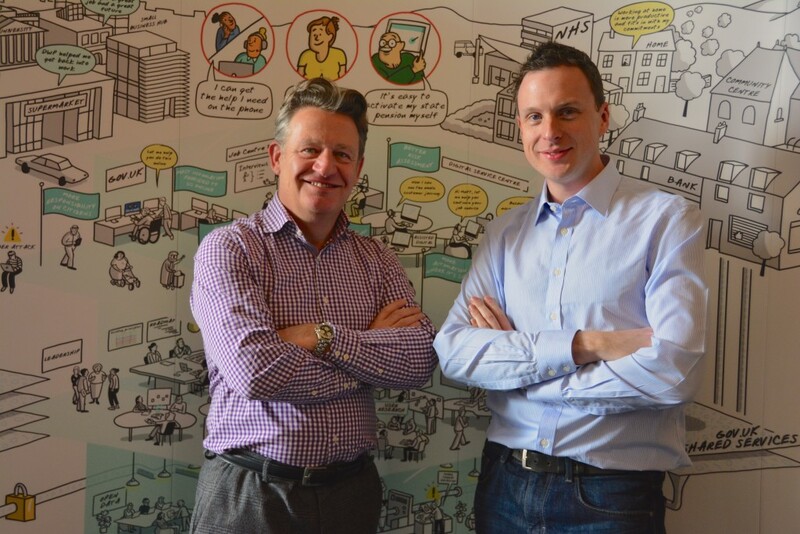 Nic Harrison and I have been using the analogy for a while of “tunnelling from both ends”. When we say “tunnelling from both ends” we mean that Nic has been working with all of the in-flight digital programmes to maximise reuse. That started with areas like storage and tools, which were the immediate areas where we needed to have shared ways of delivering our services. This work has now matured to the point where Nic’s team is building the Digital Service Centre platform for Universal Credit. So Nic has been “tunnelling forward” from the present. Meanwhile, the Business Design has been “tunnelling back” from 2020, getting that clear link through from the future customer proposition and the way we want to connect the business together to deliver those services. And in that work we’re now at the level of detail where we can see features, like the Digital Service Centres, and start to build our plans towards those. The tunnel is nowhere near finished but we now finally have that breakthrough where we can see the work meeting in the middle, and that’s building our confidence that we have been digging in the right direction. Recognise the vision is evolving: We’ve said “we need to do more”, and we will all need to work together to help evolve and grow it. We can't do this on our own. Keep in touch by following Andrew @abesford on Twitter. How can I get a copy of the picture/video? Hi Hazel - thanks for the interest. I've emailed your DWP address. I'd be interested in a copy too. Hi Andrew, CMG are looking at how we play our part in DWP and I would be really keen to get hold of the picture to help with this. I am delivering a course called Technology Futures to member at DWP and I would very much like to include the 2020 image and video as part of this course. My lead is Fidelma o'Reilly. Thank you Andrew - really clear and inspiring. Would love a copy of this Would it be possible to send this to me as I work at DWP Files/Video ? Phil, you can get hold of these from the comms and engagement team in Business Transformation Group. Look up Andrew Dennehy-Neil in the directory and they will help you out.